The food distribution WMS market is mature, but differentiation remains in usability, adaptability, intelligence and how well solutions orchestrate end-to-end logistics processes. 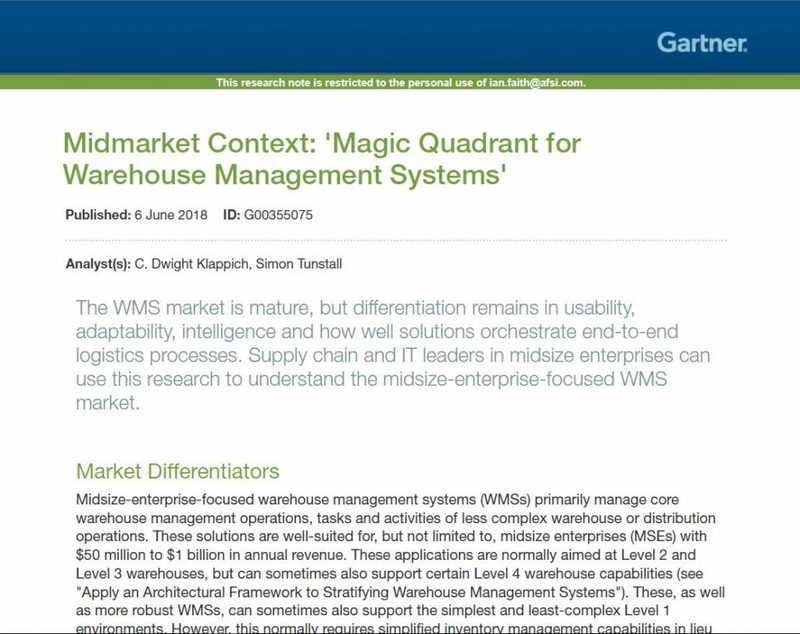 Supply chain and IT leaders in midsize enterprises can use this Gartner Magic Quadrant research of Notable Vendors to understand the midsize-enterprise-focused food distribution WMS market. When it comes to broad line food distribution software, AFS continues to rise above the competition and deliver purpose-built solutions that are second to none. Access the guide at http://wms.afsi.com. AFS wants to thank Gartner for recognizing the work AFS has put into its warehouse systems over the last 33 plus years. It has been servicing food distributors from the inception of technology in the warehouse and remains at the forefront of developing new features and functions that drive productivity. Most midsize companies don’t need advanced functionalities that raise the total-cost-of-ownership and lengthen the implementation and go-live timeframe, they need core, purpose-built functionalities in systems designed to make their lives easier. Read more at http://dist.afsi.com. This report coincides with AFS winning the Supply & Demand Chain Executive’s SDCE 100 Top Supply Chain Projects for 2018 award for its work with Watsonville Product Company and the validation of its swift implementation with minimal business disruption. Read the story. AFS Technologies (AFS) is a leading provider of software solutions purpose-built for consumer goods companies, including broad line food distribution software. We are committed to generating improved outcomes at the point of purchase coupled with generating efficiencies in trade spend, retail execution and supply chain. With experience developed over its 32-year history, AFS serves more than 1,300 customers of all sizes in more than 50 countries around the world. The AFS products are innovative, configurable solutions that are proven to optimize your potential with automated processes, improved productivity and rapid time to value.